This entry was posted in Blogging, Christmas Tree, Decorating Christmas Tree and tagged Blogging, Children, Christmas, Christmas cards, Christmas photo cards, Christmas portrait cards, Christmas tree, Christmas tree decor, Christmas tree decorating, Christmas trees, Colored lights, Family, Holiday, Thinking, Tree, White House Christmas, White lights, Writing by quirknjive. Bookmark the permalink. We have a crazy tree too. The first few years we were married (before kids), I had the perfect tree, even had ribbons cascading down perfectly on all sides. 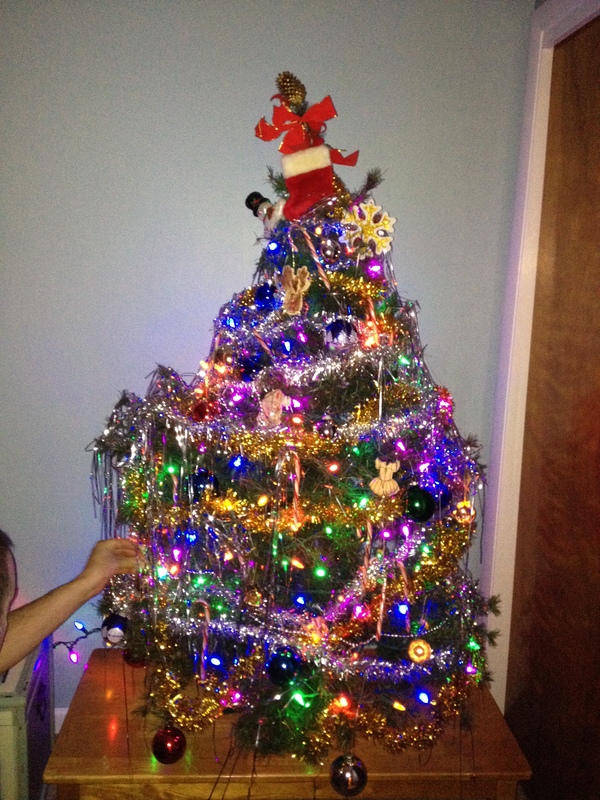 Now, it’s a combination of ornaments made at school, homemade pinterest projects gone wrong, new ornaments the kids pick out each year, and of course, colorful lights. They love it, it makes me twitchy. I might get a mini tree that I can put on my desk and decorate to perfection…but some tinsel would probably find it’s way there too. *sigh* Hehe. Lol! The things we do for our kids! You know what makes matters worse? The new LED lights! It’s nearly impossible to find the old fashioned ones anymore. Now, not only do we have colored lights, but our trees look like they belong in Vegas! And you’re right. A piece of tinsel probably would finds it’s way to your tree. Tinsel has a way of popping up just about everywhere!